When three University of Washington Doctor of Nursing practice students, Jennifer Bryson, Lauren Rotkis and Lauren Berglind visited Seattle’s Capitol Hill Peace for the Streets by Kids from the Streets (PSKS) homeless shelter as part of a service-learning requirement, they learned that the young people served by the program have already faced more challenges than most of us see in a lifetime. Like any young person, they need a safe place to sleep, support and guidance toward emotional and financial stability, and important life skills. They also need healthcare support compounded by time spent struggling for survival on the streets. “We want to help these patients seek additional care, talk about their health issues and let them know that health is a priority,” said Berglind. To do that, the students devised a longer-term Doctor of Nursing Practice Project to implement a nurse-run clinic serving homeless youth. Students Shelley Brandstetter, Alexandra Rubel and Jane Kim joined the founding team to help start and grow the clinic. 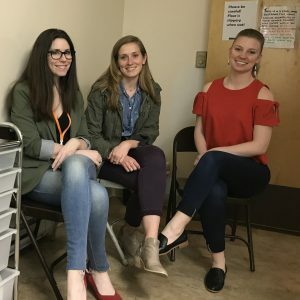 With the support of Dr. Wendy Barrington, UW assistant professor of nursing and epidemiology, the student-led team set up a permanent service-learning placement at PSKS through her course: Social Determinants of Health. To increase the long-term viability of the project, they hope to recruit UW School of Nursing Bachelor of Science Nursing Students as volunteers. “I am so impressed with their advocacy, diligence and passion for turning a service-learning class assignment into a productive and sustaining engagement,” Barrington said. The UW School of Nursing has long emphasized the importance of practical education in community settings. Through engaged outreach, nurses gain understanding about the challenges and circumstances of their patients, building connections that result in better care. “Service-learning is a transformative way for nursing students to step outside of asymmetric power structures in healthcare to partner with people in their wellness,” said Barrington. Globally and locally, from research to practice, UW School of Nursing seeks to improve health and address questions of health disparities. The partnership between Doctor of Nursing Practice students and PSKS offers a prime example of the kind of passion and professional growth that can result from time spent working with communities. It’s that kind of momentum that can lead to fundamental changes and opportunities in the nursing profession and in the healthcare landscape at large. In the case of this project, it takes the service learning intention a step further toward a long-term support system that expands the horizons and serves both nurses and homeless youth.